Would you look at that? Just look at that! I know I’m not supposed to be on the couch, person – but look! Just look at what that squirrel’s doing. We’ve got to stop him. Let me at him, person. He’ll steal them all if we don’t stop him. That squirrel’s got it in his mouth and he’s running off with it. How can you let him get away with that? 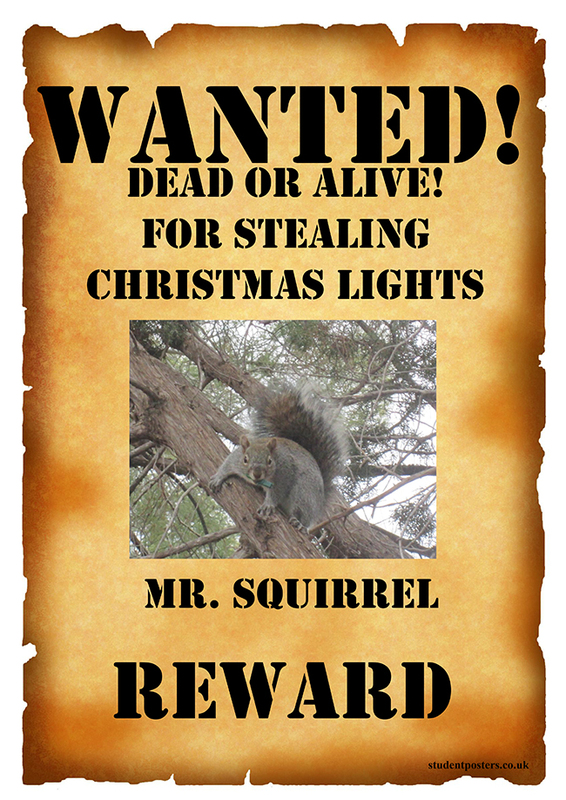 Person, that squirrel stole one of our Christmas lights! Right off the tree outside. I was watching and he didn’t even care. He just kept working at it until he got that light loose. Well, if you’re not going to do anything person, I will. And I’m going to get all my friends to help. I’ll get that pesky squirrel if it’s the last thing I do. Thanks for the poem Smilecalm. 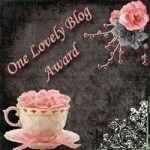 And thanks for stopping by and commenting. Bongo , you end the year with a great post that had me laughing…..If I see that pesky squirrel I shall report him to you…he is grey, with beady eyes and carrying a Christmas tree light…I see…. Thanks Patrecia. Any clues I can get on this pesky squirrel will be a great help. I’m ready to give him what for. Wow, that squirrel even posed for a picture! I can’t believe that squirrel isn’t even afraid of getting caught. Jackie, my person had to take that picture through the window. 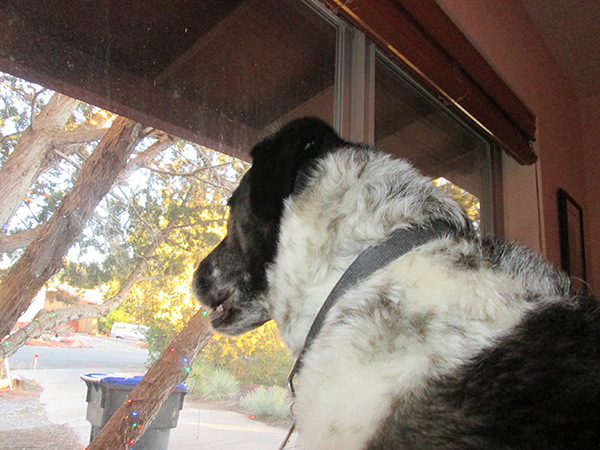 She tried to go outside but the squirrel kept running up the tree. I think she should have stayed outside. Then we might still have that Christmas light. Uhmmmm, Bongo, I’m sorry to inform you but I saw a little dog with curly light brown fur trying to steal the Christmas lights from an outdoor Christmas tree in the garden. The dog has gone missing, we haven’t seen her for days! Kolytyi, that little dog might have been put in dog jail for stealing. I’ve got to get a special squirrel jail when I catch that squirrel. It would slip right out of my dog jail. The little dog came back!!! She was sentenced only to a few days! What a relief! I think you should use your dog jail as a squirrel jail. Your person must agree with this idea! Those guys are criminals, while you are an innocent, dear gentledog! Kolytyi, I’m so glad the little dog came back. I’ve got to work on my dog jail to make it a squirrel jail. The slats are too small for me to fit through, but squirrels would have no problem. And I’ll have to take my new bed out. The squirrels would steal it and turn it into a nest. Kimberly, I’m on it! As soon as I can figure out how to climb that tree. What a nerve!!! You show that squirrel, Bongo! Marina, I might have to give away some of my treats as a reward. It will be really hard to part with them though. Ugh! What nerve! I guess if he steals enough of them, he will be able to decorate his own tree. Too late, Thief! Christmas is over. Cupcake, I wonder if that squirrel was trying to tell us it’s time to take down the Christmas lights. I’m sure he could have found a nicer way to let us know. Bongo, I’m with you all the way buddy. And the worst part about it is that now the lights won’t work! At least on our tree if a few get loose the whole string goes dark. Just think that pesky little thing is taking your LIGHT! I’ll keep an eye out for you. At least only half the string went out. But I sure hope that squirrel doesn’t try to steal another light from the other half of the string. Thanks for keeping an eye out. 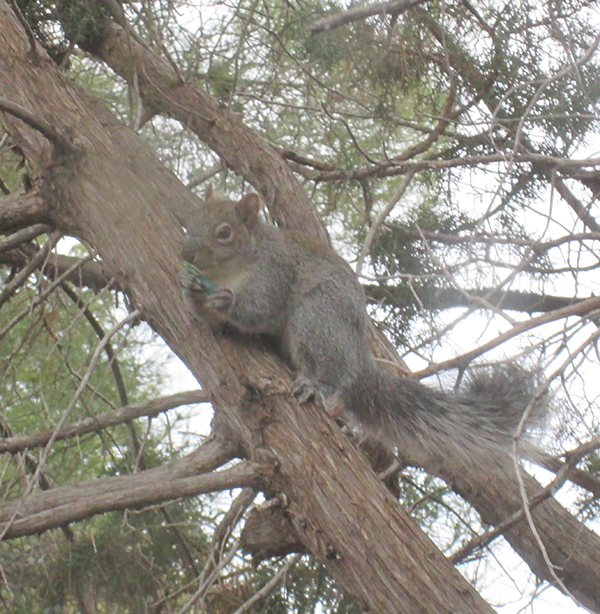 Either he is a very smart squirrel and is lighting his nest with the light or very stupid and thinks it’s a nut. Patricia, I think that squirrel is out of luck because when he stole that light he made the lights go out. Who does he think he is anyhow! Lily, I’m not sure who he thinks he is, but he’ll have another think coming after I get a hold of him. Kari, I so agree. I’ll get all those pesky squirrels yet. Happy New Year! How cute that squirrel is! *OOps! * *Hem hem*…….Of course I’ll join to get him with you, Bongo! He is the worst criminal ever! We can’t lose him and forgive him to steal your stuff !!! Grrrr…. Anyway I’ll fly there to catch him!!! Kevin, those squirrels are so sneaky. They look cute so everyone will like them and then in their cuteness they do pesky things. They even sit high in trees and harass us dogs because they know we can’t climb the tree after them. Please come on over and help me with this squirrel thief. I can use all the help I can get. Misaki, I’m working on it. If you want to come over I can use some help with my squirrel trap. Lily, I’m on it! They’ll be arresting that squirrel for sure. Ah, caught him Bongo – good job! You know Diane was digging in the back yard last year & she dug up a pretty blue ornament that she’d decorated on our little outside Christmas tree. Not only are squirrels thieves, but they’re very sneaky. Lola, those squirrels are sneaky, pesky, and a pain. I’m going to give that squirrel what for one of these days. Looks like you’ve got your work cut out for you there dude, has his bulb blown on the lights on his squirrel house and he can’t be bothered to go to the store? Snoopy, this squirrel is definitely a master of mischief. But you’re right – he should be off to the store for his supplies.